The beautiful lady behind all of your favorite current hits is also a style icon in the making – are you surprised? That’s right – British songstress Dua Lipa is unstoppable when it comes to creating the most memorable looks that are equal parts creative and covetable. She’s clearly in tune with who she is, which is a dynamic person, as you can see throughout her style choices. Dua inspires us to really listen to ourselves and wear what speaks to the core of our soul. Erase any notions of what society thinks is fashion – when you let yourself be inspired by Dua Lipa, you define what fashion is. But seriously, Dua Lipa seems to never have a fashion mishap because she totally owns whatever she wears. She knows how to mix casual pieces, modern pieces, vintage pieces, and patterns and colors to create a look that’s all her own. 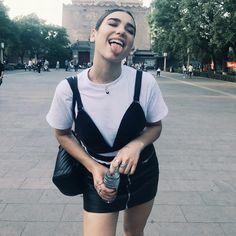 Dua Lipa is also a huge proponent of lingerie dressing, making it such an accessible aesthetic to pull off. She’s not afraid to show off her bra – and she loves all styles. We’ve seen her rock sports bras, basic bras, revealing bras, and lacy bras throughout creatively styled outfits. What’s the biggest style lesson we can learn from Dua Lipa? It’s to color outsides of the fashion lines and create your own rules. We think that’s a totally awesome fashion goal to strive for! What’s YOUR favorite celebrity style star right now? For more celebrity style, follow us on Facebook, Twitter, and Pinterest!